I’m writing this post on Wednesday 11th, ready for the I Feel Good series on Sunday. I came up with this challenge because I wanted to share pictures that weren’t all camera ready, those that you just looked in the mirror, whatever you happened to be wearing and thought "I feel good today". I want to extend that and do something a little more off piste. I see many people on Twitter say "If only people actually saw me when I wasn't posing for blog pictures". That is partly why I started the challenge but I want to take it a step further. Because today, I am not the happy, smiling blogger you always see; and I'm sharing it on my blog. Because today, I don’t feel good; not mentally anyway. I am having a dark day, which I haven’t had for months now. 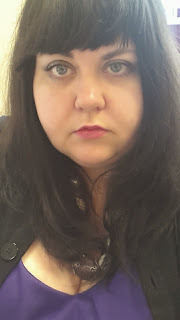 Today is not the sort of day that I would take photographs of myself because I look sad. But the aim of this challenge is to share both the good and the bad and to find the positives. So I’m using a photograph of myself today and yes, I look unhappy (and more than a little pissed off that I am forcing myself to take this photograph at all). But I am acknowledging that today is a dark day. All I can do on these days is hunker down and ride it out but I know that at the end of it, I'll be back to my smiling self. No doubt by the time this post is live on the blog on Sunday I will be happy again and the shadowy fog will have lifted. But I feel that it is important to acknowledge to myself that this side of me exists too. I am the happy smiling girl you normally see in my photographs but I am also this too. Today, this is who I am and that is ok. I don't have to always be the perfect version of myself. On here, I share all of me. Sorry if I have depressed anyone there. Check out the other ladies involved in this challenge and hopefully they will have a happier face for you.